The Bissell U1451-PK25 replacement bag should replace the dirty bag in a vacuum. This particular bag is designed to fit in the Bissell BGU1451T upright vacuum. 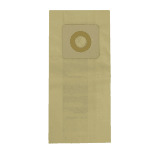 The Bissell U1451-PK25 replacement bag comes in a pack of 25 so they can be replaced easily.